BEVERLY HILLS, Calif. - Aug. 24, 2017 - PRLog -- Avente Tile launched AventeTile.com (https://www.aventetile.com), a a newly re-designed and updated website devoted to encaustic cement tile and hand painted ceramic tile. The new website launched on August 15, 2017. The newly designed site replaces the original website designed when the company launched in October 2002. The new website provides responsive design for mobile users and an updated product catalog that provides more detailed information on product colors, prices, sizes, and technical data. Additionally, online inventory is available for stocked products. Now residential customers, designers and architects can check availability and incoming stock to make smarter purchasing decisions. 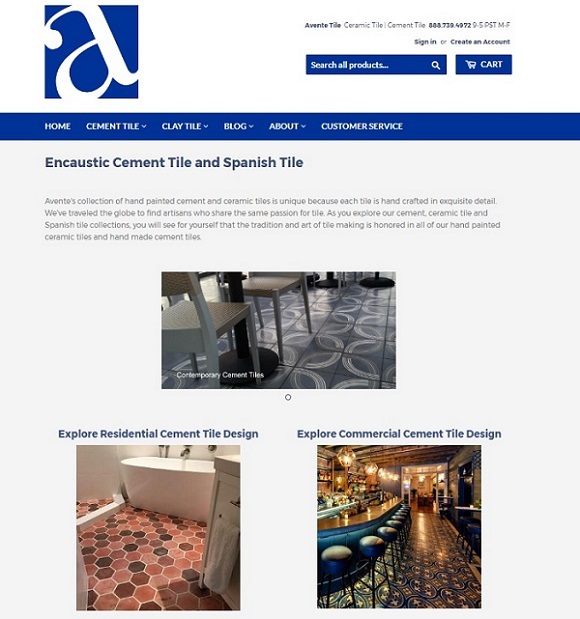 The Avente Tile Blog, Cement Tile Design Ideas, and Ceramic Tile Design Ideas are also organized by application (i.e., floors, fountains, walls) and design keywords (restuarant, kitchen) to make browsing tile inspiration easier. Avente Tile Owner, Bill Buyok, is excited about the updated website. He noted, "Our Version 1.0 site served us well. However, so much has changed in 15 years since we launched the company and the initial website. It was critical to update the site and provide the tools for mobile users and improve the online catalog, inventory and browsing experience to stay competitive. I'm thrilled that our commercial and residential customers will have a better shopping experience!"